Q. How Do I Use Categories? 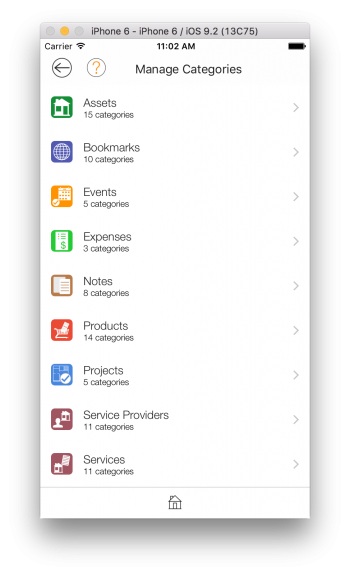 In the Manage Categories view, you can add, delete, and modify any of the categories in your LightArrow app. You can set categories for Assets, Bookmarks, Events, Expenses, Notes, Products, Projects, Service Providers, Services, Subjects, Log Entry Units, or Shopping Items Units. For example, a category for Services might be “Assets” and a subcategory could be “Auto Repairs.” Auto Repairs would hold items such as timing belt or tire repairs. Your app comes pre-loaded with categories that you can remove or modify, depending on the types of categories that are suitable for your life or work. In some cases, you’re not able to remove default categories, such as “Media.” In these cases, you can hide the category. When a category is deleted, it is completely removed from your app. When a category is hidden, it no longer appears in the Categories tile (in it’s associated topic), but it remains defined, and is still available. Note: You can also manage categories from other areas of the app (other than through Settings), for example, when you’re creating projects you can tap Manage Categories. Go to Settings -> Manage Categories. Tap the object you wish to add categories to. Tap the plus sign at the top of the Manage Categories view to add a top-level category. To add a subcategory for a parent category, tap the parent category and then tap Subcategories. Tap the plus sign to add subcategories. Type the name for the category and an optional comment. If you wish the category to be hidden from view, turn Hide to ON. You cannot remove categories that have items associated with them. Tap the object you wish to remove categories from. To remove a subcategory for a parent category, tap the parent category and then tap Subcategories. You can swipe a category (to the left) to delete it or tap the category and then tap Delete. Tap the object you wish to modify categories from. To modify a subcategory for a parent category, tap the parent category and then tap Subcategories. If you wish the category to be hidden from view, turn.Hide to ON. Note: You can also create a new category directly from the Categories tile in the details for most objects. For example, suppose you are defining a new event and, after tapping Categories, you decide that the category you want to associate the event with is not listed. From that category picker, simply tap the plus sign to display the New Category view.